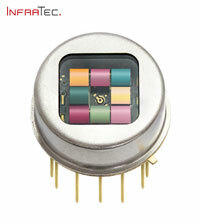 InfraTec GmbH: Pyroelectric detectors are ideally suited for gas analysis. Until now, this has been complicated if many gases should be measured. There were often simply too few measuring channels for this purpose. The new LRM-278 from InfraTec now offers exactly the right solution for this. Combining eight channels in a TO8 housing with a diameter of 15.2 millimetres this detectors is the first of its kind worldwide. As a result, the number of gases that can be measured with a single detector of this size has doubled in one fell swoop.